Giant ring system around a WASP exoplanet? In April 2007 WASP-South saw a star undergo a complex series of deep dips in its light. One interpretation is that the star was being occulted by a complex ring system surrounding a planet orbiting that star. 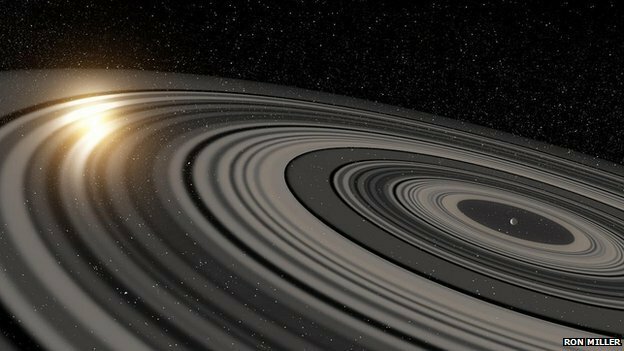 A paper to be published in the Astrophysical Journal, by Matthew Kenworthy and Eric Mamajek, argues that the ring system would have to be 200 times bigger than Saturn’s rings, and is divided up into 37 different rings, perhaps sculpted by the presence of exo-moons orbiting the planet. If true, this is the first strong evidence for both ring systems and moons outside our own Solar System, and would be a notable first for the WASP project. 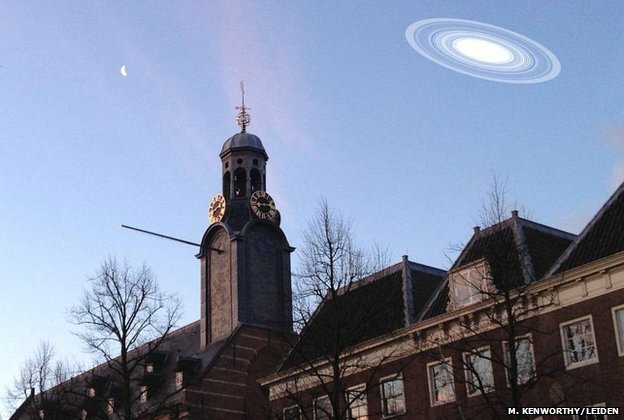 A press release by the team from the Leiden Observatory and the University of Rochester has been picked up by the BBC and several dozen other websites such as Science News. Accompanying the press release are artist’s illustrations of the ring system (above) and an impression of how the ringed planet might look to us if it were in our own Solar System in place of Saturn. This entry was posted in WASP planets and tagged exomoons, planetary rings on February 6, 2015 by waspplanets.